When putting in a central air conditioning unit, you need to make two primary considerations in determining what type of air conditioning unit you get. The first of these is the size of the unit, which is generally expressed in terms of tonnage. Units can be 1-ton units, 1.5-ton units and so on. The bigger the house, the larger the unit required. The second consideration is the Seasonal Energy Efficiency Ratio or SEER rating that tells the actual energy efficiency of the unit. Requirements vary by home size. High-efficiency air conditioners can save more money than lower-efficiency units. Your home's size will provide you with the first indication of what size unit you will need. This should be your first consideration when choosing an air conditioning unit because you will need an air conditioner that has the output capacity to cool the home it is intended for. A 1,600-square-foot home will generally require a 3-ton air conditioning unit. 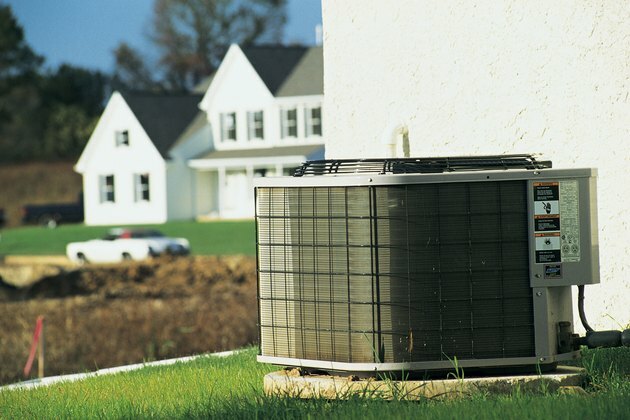 The SEER rating of an air conditioner for a 1,600-square-foot home can vary. There is no specific requirement for a specific SEER rating for a home of this size, or for any other size for that matter. As of January 2006, the U.S. Department of Energy mandated that all newly installed central air conditioning units have a minimum SEER rating of 13. Unless you are installing a used unit on your own, your air conditioner will need to be at least a 13-SEER unit. Ratings can go as high as a 27-SEER unit. The higher the SEER number, the higher the energy efficiency. You must decide which SEER rating works best for your 1,600-square-foot home. The SEER rating of an air conditioning unit is calculated by dividing its BTUs or British Thermal Units by the number of watt-hours of energy use. This provides you with the ratio of the heat removal ability of the unit to the amount of energy it takes to remove the heat. To calculate your potential energy savings with each SEER rating, determine your local electricity rate in kilowatts per hour and multiply that rate times the number of expected kilowatts to be used by each SEER system. This will provide you with an idea of the savings as you move from one SEER rating to the next. When choosing your SEER rating, you don't necessarily have to go with the highest rating possible. However, over the long haul, doing so will save you considerably more money than if you go with a lower SEER rating. For example, you can generally save about twice as much with a 27-SEER rating over a 13-SEER unit. If that difference calculates to $300 per year, then over a 10-year span you will save $3,000. Also, as the cost of electricity rises, the overall savings will increase as well. How Much Amperage Does a Fridge Use?